A certain man claims that "Justice is about robbing." YAMANEKO(Kazuya Kamenashi from "KAT-TUN") is notoriously elusive, but wherever he shows up, enormous amounts of money gets stolen. Evidence of the audacious crime is left scattered all over the place. In every episode, YAMANEKO the hero thiefthrows a splash of �grotten justice�h in your face. Pretentiously calling himself a �ggenius thief,�h YAMANEKO is arrogant and acts like he�fs the king of the world. Everything he does is bold and daring, but he remains elusive. There is indeed no match for YAMANEKO. Why does he steal? Just what is he all about? These are the great mysteries of this incredibly entertaining yet highly unpredictable story! 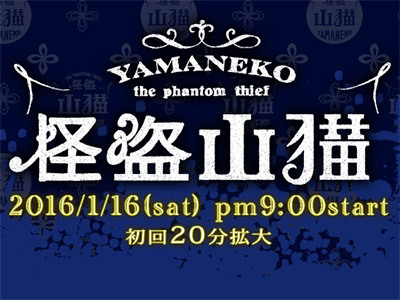 YAMANEKO -- a new thief and hero emerges! It had an interesting premise, unfortunately ruined by poor dialogues and by the lead actor's "acting" which was incredibly annoying (why the hell does he keep shouting the whole time?!?). I endured that torture for 3 eps. so as to see if it showed signs of improvement. It didn't. kame's acting in this drama is very enjoyable. it probably is his best drama among all that i watched. the casts in this drama really make it a good drama. story was good. Got better as it went along. The last two episodes were the best, especially episode 9. Hiroki Nariymiya as Katsumura and Hiroyuki Ikeuchi as Inui were both great.